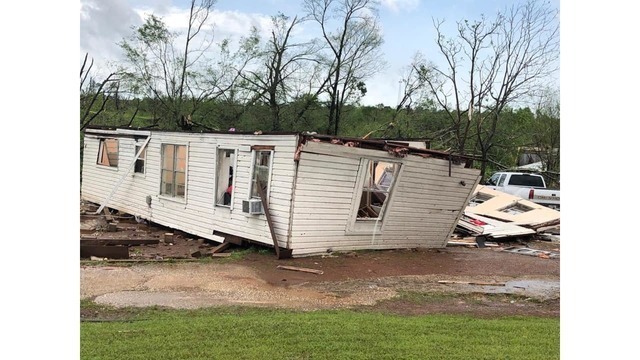 Two tornadoes were confirmed by the National Weather Service over the weekend in Cherokee County. This system produced the first strong tornadoes in East Texas in almost two years. Many homes were damaged and destroyed with multiple fatalities as a result of the storms. The first tornado for Cherokee County began at approximatly 11:46AM, 6 miles SSW of Alto. Peak windspeed of 120mph giving it an EF2 rating, it left a path of destruction .8 miles long with a width of 400 yards. Fortunetly this caused no injuries or fatalities. Multiple viehicles and dozens of trees snapped and the damage was minimal. The second tornado that ripped through Cherokee County was much larger and began at 1:18 PM, 7 miles SW Alto. Peak wind speeds hit 160mph giving it an EF3 rating and was on the ground for 29.4 miles with a width of 880 yards. Unfortunetly this directly resulted in one death and 20 injuries. Many homes were destroyed as this storm ran parellel with Highway 21. The third tornado from Saturday occured in far eastern Nacogdoches county at 2:38 PM, 3 miles SW of Chireno. Peak winds at 95mph giving it an EF1 rating. It was on the ground for about 1 minute with a path width of 100 yards. The tornado touched down along CR 442 with many trees uprooted in a wooded area. It lifted east of CR 443 where a 100 foot section of tin roofing from a vacant chicken house. Just hours earlier three seperate tornadoes were confirmed by the National Weather Service in Houston County. This tornado first touched down in the Weches area. Damage was consistent with wind speeds 136 to 165mph giving it an EF3 rating. 1 fatality was confirmed with nobody else injured. A slightly weaker storm with an EF2 rating, winds over 111mph. This storm was closer to the Lovelady area and produced a track 3.8 miles long and 100 yards wide. 0 deaths and 0 injured but many trees damaged. Near Ratcliff the final twister was considered a weak tornado, winds 86 to 110mph and damage consistent with an EF1. 0 deaths but 4 injured.